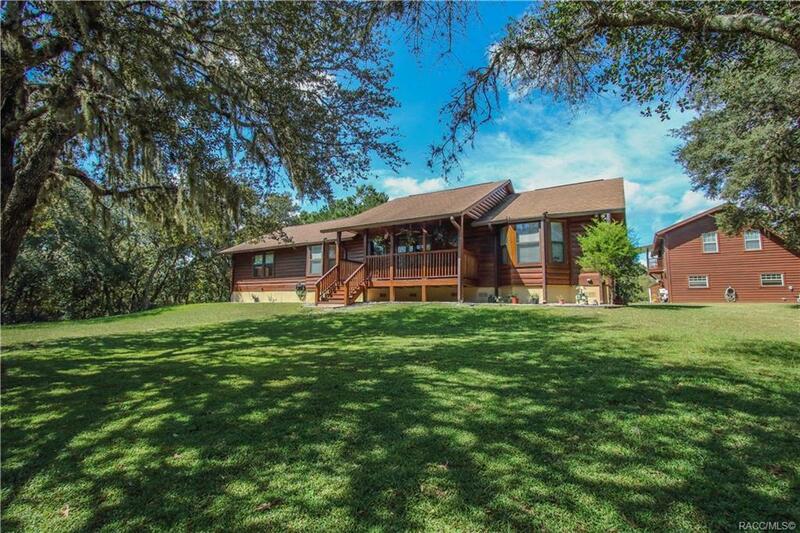 Beautiful log home on 4.5 acres! Income producing potential property or bring the extended family. Along with the 3/2 main house, this property has a 2/1 upstairs apartment over the massive 3 car garage/workshop. The ultimate man cave! Lots of room and privacy for everything. Bring all the toys to this one! No restrictions. Start a business! Horses and livestock welcome. Home and buildings are rock solid with that 'Old Florida' Flair. Park like feel, only minutes from shopping and restaurants. Original owners have meticulously maintained this special property. Home boast gorgeous, authentic, cypress ceiling and wood throughout. Mr and Ms clean live here. House and grounds are well cared for. Large great room, lots of light with an open airy feel. Relax on your upstairs porch and balcony. Main home also has a garage. Even comes with 2 Key West showers. If your looking for room to grow in an original, one of a kind home in excellent condition you need to check this out. Directions: Hwy 44 West To Kensington Ave Turn Right To Home On Left.